Terry will share her learning and show Dr. Eric Pearl’s wisdom through Scientific Research. We will have fun as we PLAY with energy together! 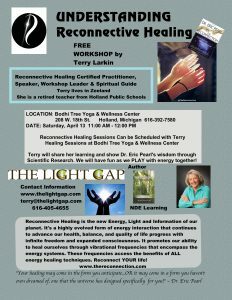 Terry is now offering Reconnective Healing Sessions! She has been working with Dr. Eric Pearl for the past year completing requirements to become certified. Reconnective Healing is a PERFECT match for everything I learned during my NDE along with 25 years of research in the field of energy healing. Reconnective Healing® is often a life-changing experience, allowing for the healing of body, mind and spirit, restoring optimal health, balance and vitality at a profound level. Its first basic element is energy. Energy is everything we are made up of organically, our very essence and our actual physical body. Light is the resonance and communication within these frequencies between the universe and us. We are now offering a workshop designed to make positive changes in our ongoing quest for healthy bodies. Terry’s Near- Death Experience brought a knowing that we can help heal ourselves. How in the world we can do this? Terry was faced with serious illness in recent years and began using medical meditations and energy medicine techniques. Intense research began and has continued over a period of 10 years. 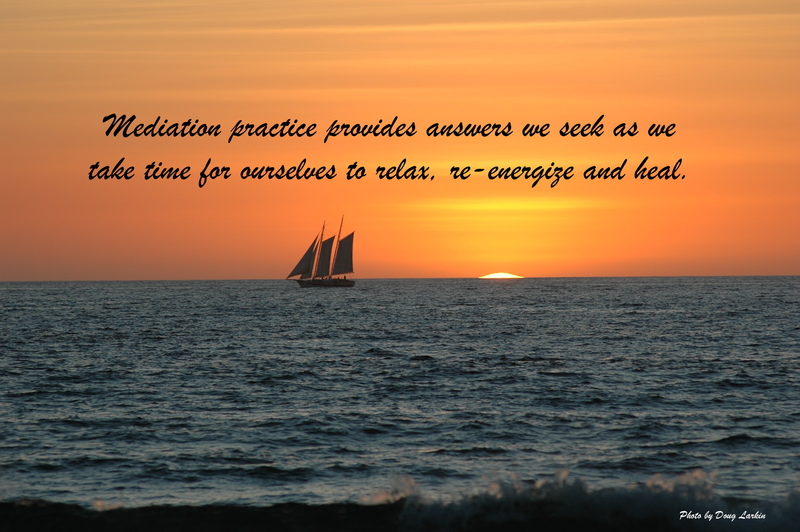 Using our medical professionals, we can team up together and we indeed can make a difference in our own healing. 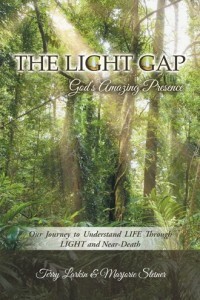 Terry shares experts she has studied intensely through research for the book, The Light GAP co-authoried with Marj Steiner. Scientists, neuroscientists, psychologists, medical scientists, physicians, and spiritual leaders will be highlighted throughout the presentation. Research is proving we indeed CAN do some pretty amazing things on behalf of our own health. God is our constant mentor. Come find out what experts telling us! Terry’s healing journey is told in Chapter 6 in our book. There is so much more to SHARE! 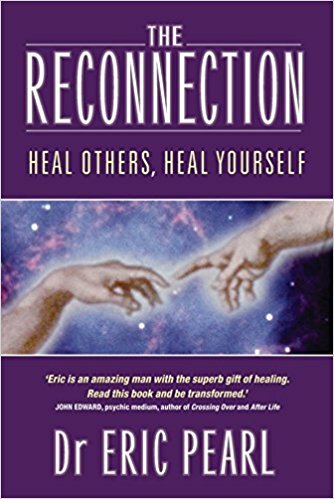 But the ultimate healing came when she began studying with Dr. Eric Pearl, Jillian Freer and many amazing and talented practitioners of Reconnective healing. I am not teaching Reconnective Healing, I am offering Reconnective Healing Sessions. Meditation is only the beginning. Tapping into our own individual energy field and launching into Energy Medicine, knowing where to begin can be overwhelming. Terry is helping make this a practical everyday experience for the novice. We all need to fix or maintain our homes. Our bodies are HOME for our soul. Our health is one of our greatest treasures. Repair is possible and maintenance is a MUST! Our workshop is never a substitute for professional medical care. It’s to add depth to the healing. Come ready for very special learning. Higher dimensions of consciousness are designed to enhance the physical body. Yet the average person has no idea how to cultivate this inner healing force. Join live-streaming, archives of presentations or COME! 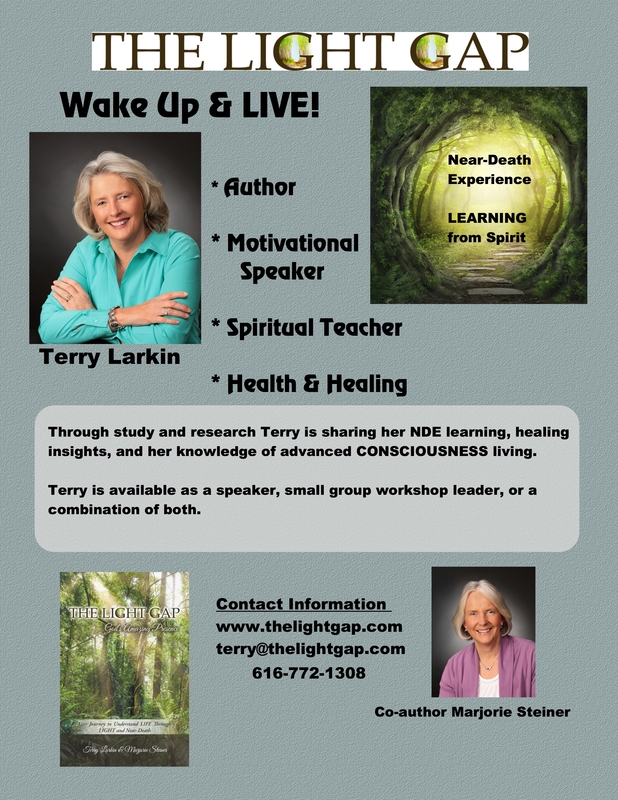 Terry Larkin is offering a key-note presentation as a motivational speaker helping the audience understand what happens when we die and how our body, mind and spirit work together to allow us to live our lives full of love, health, and laughter. Understanding the science behind our heart to brain connection will be highlighted. Terry helps the audience understand how opening our spiritual lives through God’s unconditional love connects inside our bodies bringing joy, peace, strength, and courage to live a full healthy, happy life. Using her sense of humor Terry shares her NDE experience in light, years of research and practical every day experiences to bring new direction to seekers of spiritual growth. ( NEW) Health & Healing : The Leading Causes of Health! 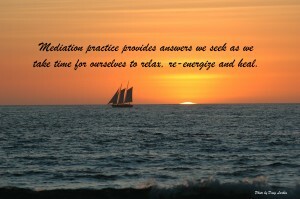 ~ Putting all the pieces of mind, body and spirit into a practical, every day life. This workshop is now designed as a half day workshop meant to give the participant all of tools needed with hands on experience in meditation, tapping and other energy medicine techniques. 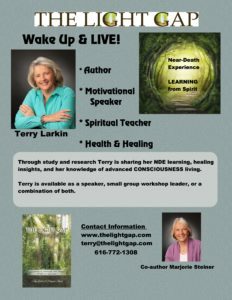 Terry’s NDE, years of research, and first hand experiences in healing are entwined with hands on teaching. She is encouraging participants to come ready to TRY it all for themselves. * See BELOW for a longer description. * Also see the description in the TAB Health & Healing. Health & Healing: The Leading Causes of Health! We are now offering a workshop designed to make positive changes in our ongoing quest for healthy bodies. Terry’s Near- Death Experience brought a knowing that we can help heal ourselves. How in the world we can do this? Terry was faced with serious illness in recent years and began using medical meditations and energy medicine techniques. Intense research began and has continued over a period of 10 years. Using our medical professionals, we can team up together and we indeed can make a difference in our own healing. Terry shares experts she has studied intensely through research for the book, The Light GAP co-authoried with Marj Steiner. Scientists, neuroscientists, psychologists, medical scientists, physicians, and spiritual leaders will be highlighted throughout the presentation. Research is proving we indeed CAN do some pretty amazing things on behalf of our own health. God is our constant mentor. Come find out what experts telling us! Terry’s healing journey is told in Chapter 6 in our book. There is so much more to SHARE! * CONTACT US if your group or area is interested in our workshops! See more information about our Health and Healing workshop in the EVENTS TAB on our HOME page.